We (Okechukwu Ukaga, Chris Maser, and Michael Reichenbach) have come together out of a sense of trusteeship for the generations of children of today, tomorrow, and beyond to create a book that will help protect for them a future of good quality. The purpose of our book is to frame in the positive some of the most important, human-related aspects of sustainable development. There is great power in learning to think in a positive mode. In so doing, members of a community can create a shared vision whereby they not only understand their community from several vantage points but also understand that much of the confusion in communication comes from trying to move away from negatives. Trying to move away from a negative precludes people from saying what they really mean because they are focused on what they do not want. As long as people express what they do not want, it is virtually impossible to figure out what they do want because they are "symptomatic" in our thinking as opposed to "systemic." In other words, we continually focus on and attempt to treat the symptoms of today's emerging global crises, but we refuse to deal with the cause—which in part is the opulence of our Western industrial lifestyle. These crises include a warming climate, per-capita shrinking of natural resources due to a human population that is rapidly exceeding the global carrying capacity, and the ever-growing disparity between the rich and poor peoples and nations. We cannot, however, move away from an unwanted, negative circumstance. We can only move toward a desired, positive outcome. To help us elucidate our common journey toward a positive future for all generations, we have invited distinguished practitioners and scholars to contribute their expertise to help reveal the multidimensional nature of sustainable development. Their approaches include strong theoretical and historical pieces as well as salient case examples, which illustrate the outcome of each model or framework. "Coined in the 1970s, the term sustainable development and the ideas behind it have enjoyed varying amounts of popularity over the years. And while dire predictions abound, the full impacts of global warming are not known, nor can they be known. What we do know is that to be sustainable, all societies must adjust to new realities, which include changing ecosystems and natural limits to growth. How do we address these issues and maintain an equitable way of life for all on the planet? 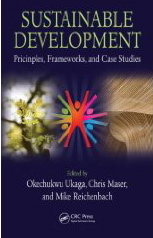 "Exploring the human-related aspects of sustainable development, Sustainable Development: Principles, Frameworks, and Case Studies emphasizes the need to move away from an unwanted circumstance by being systemic in our thinking instead of symptomatic. The authors argue that we cannot move away from an unwanted, negative circumstance, unless we can move toward a desired, positive outcome. The text summarizes positive approaches and presents strong theoretical and historical concepts along with salient case examples that illustrate the desired outcome of each model or framework discussed.